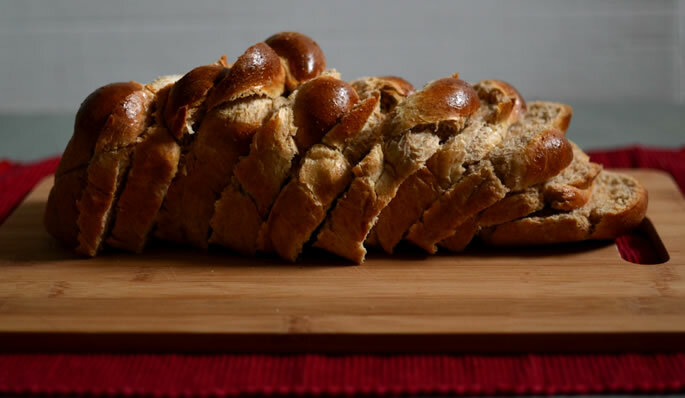 There is a tradition in some Jewish communities to make shlissel challah the week after Passover. Shlissel means “key,” and the custom involves either baking the challah in the shape of a key, or wrapping ones real house (or business) key in foil and pressing it into the underside of the challah before baking. The key is removed before the challah is eaten, and the tradition is considered a segulah (spiritually propitious) for livelihood. Have you made challah before? Or do you have bread-baking-phobia (not uncommon, even among seasoned cooks)? 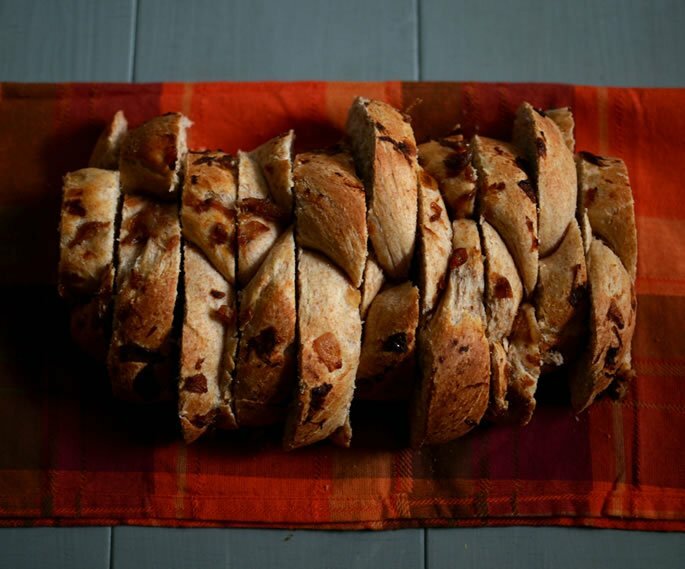 This is my sister-in-law's delicious whole wheat challah recipe. 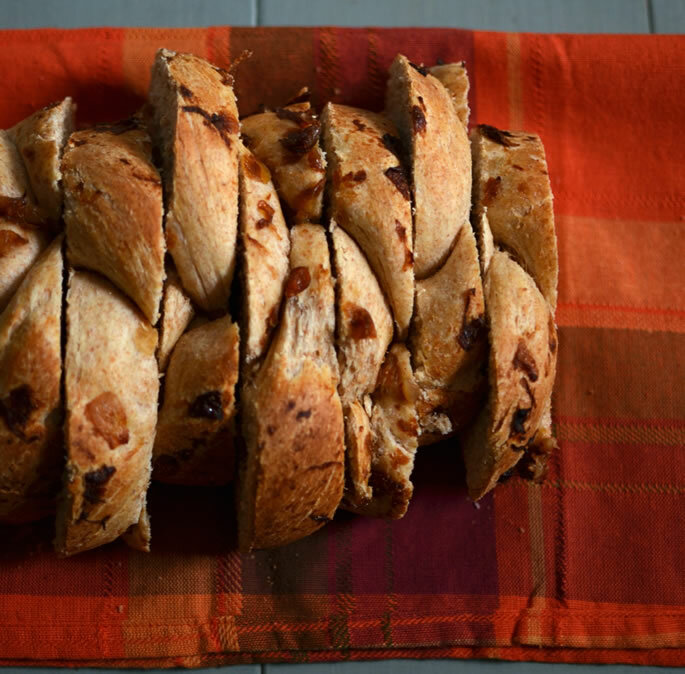 If you prefer white challah, use this recipe. A big part of making challah is doing the mitzvah of separating challah. After the dough has risen, say the blessing, separate a small piece of dough, and set it aside to burn after the loaves have finished baking. For more about this mitzvah, and a step-by-step guide, watch this short do-it-yourself clip. You can see in the pictures, I made two different types of challahs with the same dough. I did a traditional 3-braid challah, which I topped with sautéed onion, and I did a 6-braid challah which I egg washed for a simple, shiny finish. You can also use crushed garlic or sesame or poppy seeds. Other popular toppings include raisins, cinnamon sugar and pesto. It's up to you. You can also see that I baked the challahs in two different kinds of pans. 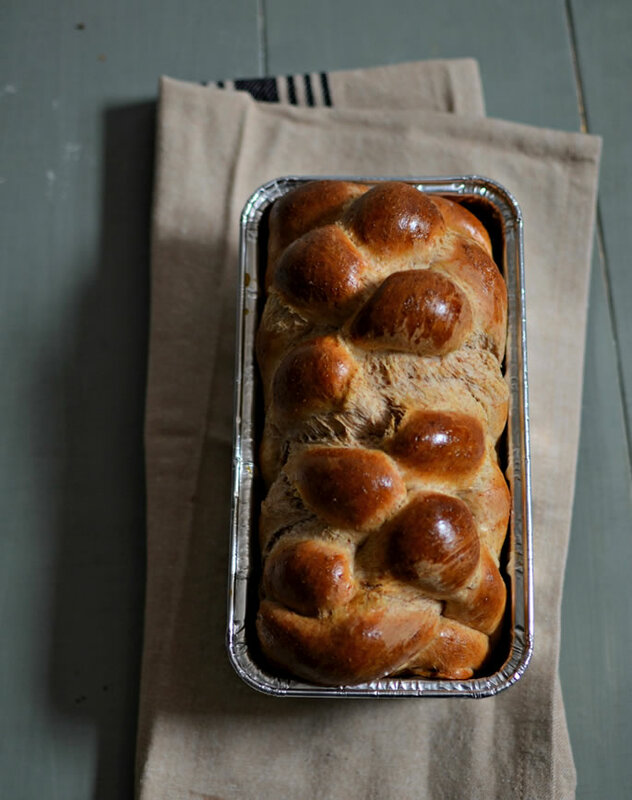 A cookie sheet gives the challah more space to spread out, whereas a loaf pan keeps it more contained. Again, it all comes down to personal preference. After the mixture has bubbled, add the eggs, oil, honey, salt and the rest of the sugar and warm water. Mix until just combined. Add the whole wheat flour first and mix well. Add the bread flour a few cups at a time and keep mixing until you have a soft ball of dough. The more you knead the dough, the better. If you're using a mixer, the machine can do the kneading for you. Just leave it turning on a low speed for 5+ minutes. If you're kneading by hand, turn the dough out onto a table to counter and knead for a good 10 minutes. Put the dough in a bowl, cover tightly with saran wrap and leave to rise. You can put it in a warm place to rise for 2-2½ hours, or in the fridge overnight for a slow rise. When the dough has finished rising, do the mitzvah of separating challah. Then tip it out and divide into 5-6 pieces. 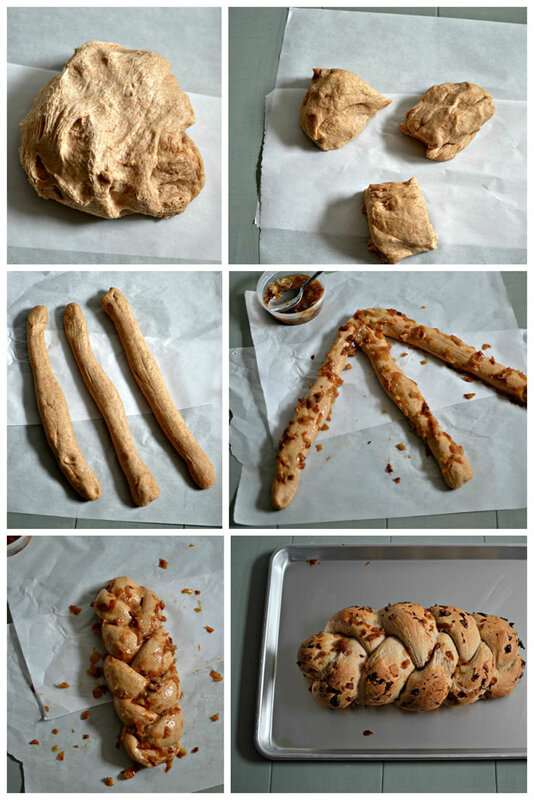 Each of the pieces will become 1 challah. If the dough feels a little sticky, dust your hands with flour so you can work with it easily. Divide each piece of dough into either 3 or 6 strands (depending on whether you want to do a traditional 3-braid challah or a more complex 6-braid.) If you want to make an onion challah, rub each strand with the onion mixture before braiding. Then smear more onion mixture over the top when done. To make a plain challah, brush the top with beaten egg. Place the challahs on a pan. Use 11x17 cookie sheets (2 challahs per pan), or put them in loaf pans. Let the loaves rise for 15-20 minutes after braiding, then bake on 350°F for 45 minutes. I think with full whole wheat it will be too dry and dense. I would look for a recipe that is made to use all whole wheat. water Yes, that is correct. 1/2 cup with the yeast, then the other 4 cups added later. first, you have to mix 1/2 cup water with 2 tbsp sugar and the yeast. Then, as you are making the dough, you have to add the rest of the water (4 cups). You can definitely cook the onions less beforehand. Some people even put them on raw and let them cook from the oven heat. you could also try moving your rack down lower in the oven if the tops are getting burned. I made the challa with the fried onions on top and it came out great! However i fried the onions until light brown before pasting on top of the challa. After i baked the challas the onions were burnt.